The Galway hurlers head to Walsh Park in Waterford this Sunday (3pm ) knowing that they must secure a victory if they are to have any chance of avoiding a relegation play-off in two weeks time, to see which team from Division 1A will ply their trade in 1B in 2014. Even a win on Sunday may not be enough to avoid a relegation play-off, if other results go against them. Currently Galway are bottom of the table on three points with four other teams on four points and Waterford with wins over Tipperary and Clare and a draw with Cork top of the table on five points. Also in action on Sunday in Division 1A, are Tipp v Clare (Thurles ) and Kilkenny vs Cork (Nowlan Park ). If Galway are to get anything from their long trip Waterford they will need to be more ruthless in front of goal, than they were last Sunday in Pearse Stadium when they drew 2-12 to 2-12 with Jimmy Barry Murphy's Cork. It was a game that many maroon supporters felt Galway should have won. They were four points to the good with 16 minutes to go and they also had a nice breeze at their backs to help them finish off the job. Instead it was Cork who rallied in the final quarter to secure a valuable league point and head South contented enough. Cork led narrowly at half time by 1-7 to 1-6, but they had also hit 10 first-half wides which many in the 6,000 plus crowd felt would prove costly when Galway had the elements at their backs. Cork themselves were not happy with their shot selection and Cork selector Kieran Kingston. did not pull lightly on his forwards in the post match interview. Cork were not the only ones asking themselves questions after the tie and a real concern for the Galway management team will be their continuing overdependence on Joe Canning for scores, from both placed balls and play. Only three Galway players scored last weekend with Canning ending with 0-10 (0-6 frees, 0-1 S/L cut ). The other scorers were Cyril Donnellan 1-2 and Davy Glennon 1-0. Galway are expected to welcome back some of the St. Thomas' players from their All-Ireland club winning exploits for the clash with Waterford and their impetus will be vital to add a bit of sparkle to Galway's play. Scorers for Galway against Cork: J Canning 0-10; C Donnellan 1-2; D Glennon 1-0. 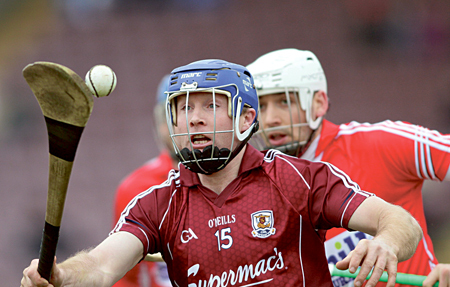 Galway: C. Callanan, F. Moore (Cpt ), K. Hynes, N. Donoghue, A. Harte. D. Collins, J. Coen, I. Tannian, A.Smyth, J. Cooney, J. Glynn, D. Glennon, C. Donnellan, J. Canning, D. Hayes. Subs used: T Haran for Glennon (66 ); B Flaherty for Smyth (68 ).